Isn’t it always cooler to recover from a serious injury in a medieval castle? Kevin Durant was a mess this year. He missed the first 17 games of the season with a fracture in his right foot, came back, hurt his ankle, came back, hurt his toe, walked through a dark castle hallway, tripped on the shag carpet, hurt his right foot again, and resigned himself to a wheelchair and crocheted afghan for the rest of the year. 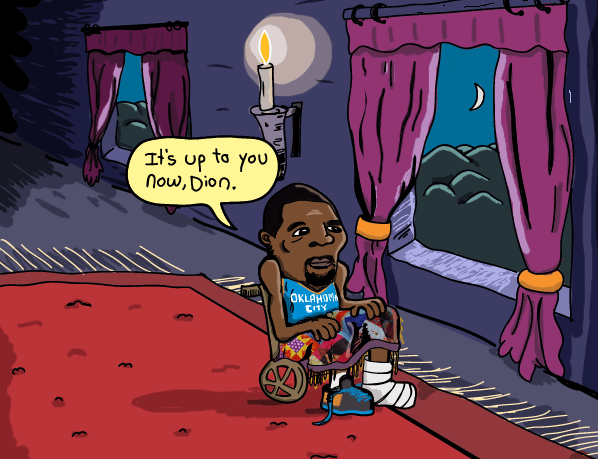 After Durant went down the Thunder had nowhere to turn. Do you honestly think Russel Westbrook has what it takes to lead a team? Scoff. Only one man on the Thunder that year had the balls to lead the Playoff Push: Dion Waiters. They did not make the playoffs that year.